Organizations may see the release of the new Google ads interface as a road block to their digital advertising efforts, while a large portion digital advertisers have resisted the transition to the new interface for as long as humanly possible. I hate to admit it, but for many months, I was one of them. After all, everyone loves the speedy workflow you get from the tools you’re familiar with. Relearning a complex tool such as Google Ads is a hassle for vets of the old platform and for organizations that are thinking about entering the pay-per-click world, it seems like a good excuse to hold-off for a few more months. I decided to write this article to relieve the fear that your organization may have from the launch of the new Google Ads interface in July. Not only should you not be afraid, you should embrace it! Advertisers will have more tools to ensure that your ROI goals for Google Ads spend are met. Below are a handful of reasons why Google’s newest rendition of the platform can enhance your digital marketing efforts. Age group and gender demographic targeting are incredibly useful features that were introduced to us awhile ago. The new interface supplements our demographic targeting with two new variables, parental status for Search ads, and household income. Previously, the parental status targeting was only available for Display, and locations were only targeted based on their relative average household income. Now, advertisers have the option to target individuals based on relative household income. If you have enough data, advertisers can even make bid adjustments for combinations of every demographic targeting variable to ensure your product or service reaches the best audience more often. Understanding how your landing pages perform is key to developing a successful digital advertising strategy. The new Landing Pages tab in the new AdWords interface lets you breakdown performance metrics by landing page, which can be incredibly useful in analyzing the elements of your pages that perform well. Google has also added a “Mobile-friendly click rate”, which details the percentage of mobile clicks that go to a mobile-friendly page. 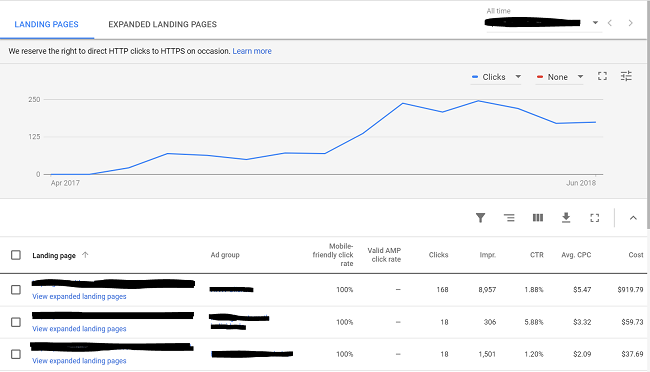 For AMP users, Google Ads reports the percentage of clicks that land on a valid AMP page as determined by the AMP Validator. I seriously cannot give enough praise to the new Overview tab. This thing is intuitive, sleek, and downright useful. In my opinion, it functions exactly as it should, giving advertisers a snapshot of performance by campaign, ads, keywords, search terms, and more. If you’re new to Google Ads, then the overview tab may look a little confusing. However, seasoned digital marketers will be able to identify key areas of improvement and more easily diagnose issues. New insights such as “biggest changes” and “new phrases your ads have shown for” are a welcome change. Additionally, the presentation for Auction Insights, Devices, and Day & Hour, are very easy to read. The new Overview tab can also be viewed at the campaign level and each report snapshot links its respective section in AdWords where you can make adjustments. Good job, Google! As mentioned, it took me a minute to get used to the idea of letting go of the old Google Ads interface that I know and love, but since making the transition, I wish I had switched over sooner. I think the new design is polished and easier to manage, and the new features are very useful. I’d bet Google has a few more tricks up its sleeve in the form of new feature for the interface, but I guess we will have to wait and see. In the meantime, embrace the new layout. A year from now, I think we will see images of the old interface and wonder why we ever wanted to hold on to it.